This year’s Amnesty International Midwest Regional Conference, if you haven’t yet heard, is in St. Louis at the Sheraton St. Louis City Center. If you’re not from St. Louis, or familiar with the Gateway to the West, then that information just sounds nice. The upcoming event, although awesome, also sounds too far away or too expensive for many in the Midwest to attend. Flying is the most expensive way to get to St. Louis, even if your flight is just an hour or two. 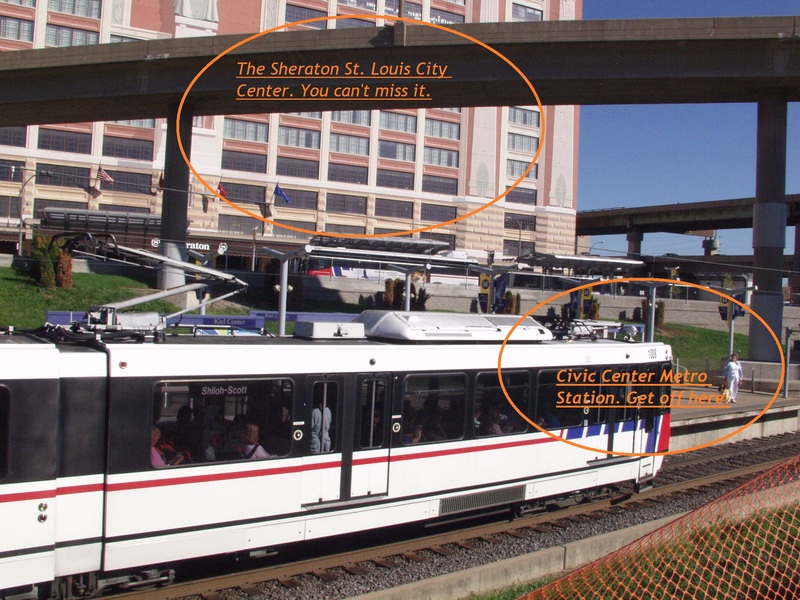 But, if you choose to get to St. Louis by airplane, then getting to the Sheraton St. Louis City Center from the airport is very easy. 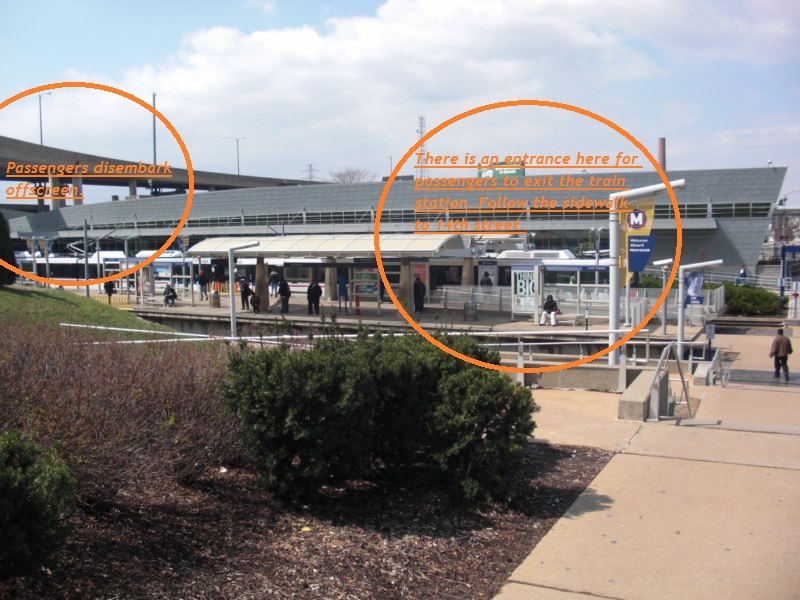 From the airport terminal, follow the signs directing you to the nearest Metrolink station. Lambert International Airport has two terminals, but each terminal has its own station. Purchase a two-hour ticket to ride the Metrolink. A two-hour ticket costs from the airport costs $4.00 (it will cost half as much when you need to go back to the airport). The ticket machines do accept debit and credit cards, but they also only give you change in $1 coins. Make sure you validate your ticket at the red validation stands BEFORE getting on the train. The stands are either located next to the ticket machine or at the entrance to the station platform. Security guards do walk through the stations to check your tickets and aren’t very lenient to tourists. Those who ride with unvalidated tickets are fined, so don’t take your chances. The trip from the airport to the CIVIC CENTER metro station is about 45 minutes, so enjoy the ride until you come to the CIVIC CENTER station (pictured below). The station is right across the street from the Sheraton (you can’t miss it), so simply exit the train at this stop and walk across the street. Enjoy the Midwest Regional Conference! The Amtrak may only be convenient for a few people since St. Louis is directly serviced by three Amtrak routes: two from Chicago and one from Kansas City, Mo. Although Amtrak is one of the more affordable transportation options, many will have to take the train to Chicago or Kansas City first before getting on a direct route to St. Louis. Find a way to get to Chicago or Kansas City, whichever is closest to you. Take the right Amtrak route, which would be the Illinois Service (Chicago), Missouri River Runner (Kansas City), or the Texas Eagle (Chicago). Exit at the St. Louis Gateway Station, also known as Amtrak Station STL, which is pictured below. Make your way past the Metrolink station to reach 14th street. Cross 14th street to reach the Sheraton, which is pictured above. The Greyhound buses may have a bad reputation, but the bus is one of the more affordable and convenient ways to travel to the conference this year. The Greyhound station, just like the Amtrak and the Metrolink station, is right across the street from the conference hotel. Schedule your trip with Greyhound. Our research found that only four cities in the Midwest have direct, express routes to St. Louis: Chicago, Minneapolis, Milwaukee, and Champaign, Ill.
You may have to leave Thursday or early Friday to make it to the conference on time. Those coming from Kansas, South Dakota, North Dakota, Nebraska, Ohio, Kentucky and Michigan will have to leave on Thursday or miss Friday’s activities. Those coming from Illinois, Iowa, Indiana and other parts of Missouri can leave early Friday morning and still make it on time. Those in Minnesota and Wisconsin can either choose the express route from Minneapolis or Milwaukee or can choose to leave Thursday if you are coming from another part of the state. Make your way past the Metrolink station to reach 14th street. Cross 14th street to reach the Sheraton, which is pictured above. The bus station and the train station are in the same building, although the loading areas are in two different spots. Many Amnesty members may decide against attending this year’s regional conference because the St. Louis location is too prohibitive. Hopefully, our explanation of the various transportation options makes attendance less of a hassle since it’s easy to get to the Sheraton via Amtrak, Greyhound or airplane. None of these options requires city knowledge to navigate the streets. Mass transit will take you to the conference in one trip. Metro station photo courtesy of NextStop STL. Amtrak station photo courtesy of Count on Downtown. Mark your calendars to bring human rights home! 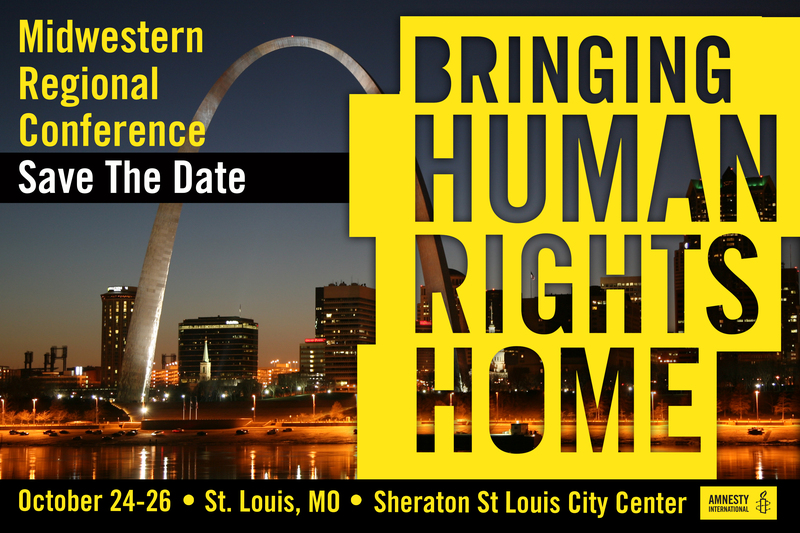 The 2014 Amnesty International Midwest Regional Conference is in St. Louis this year! The three-day conference is scheduled for October 24-26 as the Sheraton St. Louis City Center in downtown St. Louis, right across the street from the Civic Center Metrolink station on 14th Street. The registration page for the conference isn’t available yet, but if you are sure that you want to attend the conference, then make sure to book your rooms at the hotel now! Hotel rates for the conference are $85 per night, but the rate only lasts until Sept. 20 and are subject to availability. Besides the discounted room rate, conference attendees will also receive free Internet access in the room and discounted parking at the rate of $10 per day. If you’re perhaps interested in volunteering, then we will be announcing when the volunteer sign-up page is live on the Facebook event page as well. If you want to know when the registration page goes live, which should be before the end of the month, then please pledge your commitment to attend on our Facebook event page. This page will feature any and all updates regarding the conference, including when the registration page goes live and when we finalize speakers and sessions for the conference. Not only is the Amnesty International St. Louis chapter attending the conference, but many members of our chapter are also on the Planning Committee for the conference. This means the success of the conference rests with the local chapter, and we are proud of that responsibility. Our goal is to make this conference the best Midwest Regional Conference yet, and the best regional conference this year of all the regions. We believe we can achieve this goal, but reaching our goal won’t be possible unless you attend! Please mark your calendars today for the last weekend in tomorrow! Please help us bring human rights home!